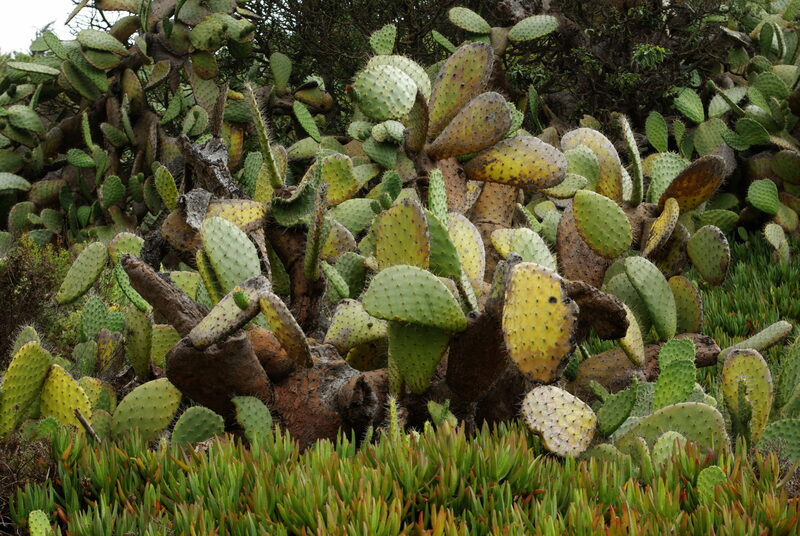 If you ever walk from Haskells Beach towards Santa Barbara, you probably have noticed the hillside below Sandpiper golf course has a large, unruly patch of cactus growing on it. We’ve always seen it there, but never really thought much about it. We figured the oil companies planted it to keep people out, but it was actually there before the oil companies came to town. This old patch of Prickly Pear cactus actually has some historical relevance and is close to 100 years old. Katherine Den was the first born child of Goleta pioneer, Nicholas Den. In the mid 1800’s Nicholas owned virtually all of Goleta from Hope Ranch to Refugio. In 1869, after his death, the estate was divided between the nine children. Kate chose 519 seaside acres that included Las Armas Canyon. Later, it was called Bell canyon, after her husband John Stewart Bell. Today, this is where the creek comes out just west of Sandpiper golf course. In 1920, Kate Den Bell called her family together for her 76th birthday celebration. It was a two week camp out on the beach at the mouth of Las Armas Canyon. The entire clan came from all across the country and tents were pitched on the dunes. On the last day of the festivities, her actual birthday, Kate called everyone together to make a birthday speech. In a very dramatic manner, the elderly Kate pointed to a nearby sand dune where a small prickly pear cactus had somehow taken root and was struggling to survive. It was the only cactus growing in the area. Kate said, “If you drill an oil well where that cactus grows, you will strike a gusher. Mark my words well, for it will make you rich one day”. No one laughed at her prediction. The signs were everywhere, the odor of oil filled the air and the beach was littered with black tar. Six years later, Katherine Den Bell passed away and her ranch was divided amongst the heirs. Meanwhile, the lonely cactus at Las Armas beach kept slowly growing, waiting unnoticed to fulfill her prophecy. The year after her death, 1927, a young geologist named Frank Morgan got his company, Rio Grande, to drill a test well on what he called the Ellwood Terrace. The property now belonged to Kate’s daughter Caroline and her husband George Luton. The exact spot Morgan drove a stake to locate the well was a few feet from the unnoticed cactus patch. Oil companies had been drilling in the area and so far were coming up dry, but in a last ditch effort to go a little deeper, they struck oil, a lot of oil. July 26th, 1928, it began producing a steady flow of 2,400 barrels a day of the richest crude oil yet found in California! A well that pays for itself in a year is considered good, this one paid for itself in two weeks! Luton-Bell No. 1 was one of the major oil strikes of all time, producing over a million barrels of quality crude oil. Immediately following this discovery, rival oil companies swarmed into the area and piers sprung up quickly along the beach from Sandpiper to Haskells Beach. Over 100 million barrels of oil came from the county. With the oil came jobs, houses, schools for the families, gas stations and restaurants. The original Ellwood school building was built by one of the oil companies. The County of Santa Barbara got a huge influx of tax revenue from the oil fields at Ellwood and it was just in the nick of time. The county had run out of money to pay for the extravagant new courthouse it was in the midst of building, and the Great Depression was looming just around the corner. If not for the gusher at Kate’s cactus, the completion of the courthouse would have been greatly delayed, and they may have had to simplify the beautiful architecture. In the 1930’s, oil tankers loaded around the clock at the Ellwood piers. Many of these tankers were from Japan. Kozo Nishino was the captain of one of these oil tankers. Legend has it that in 1939, Nishino was enjoying a morning stroll along the beach while his ship was being filled. On the bluffs he noticed a strange looking cactus surrounded by a fence and he was intrigued. In an effort to take a cutting back to his garden in Japan, he tried to climb the iron fence, but slipped and fell head first into the thorny patch. A group of American oil workers were watching from a nearby derrick and let out a howl of laughter when they saw the foreigner struggling to escape the grip of Kate’s Cactus. Nishino was deeply humiliated and he vowed revenge. A few years later, Kozo Nishino was a submarine commander in the Japanese navy. He was assigned a mission to attack California’s oil production facilities, and he knew some of them intimately, Ellwood in particular. He brought his I-17 to the surface at Goleta Point, (Campus Point today), and cruised along the coast at a leisurely five knots, in plain view of many Goletans. It was the same course his oil tanker had used to approach Ellwood in peacetime. The sub lobbed twenty five shells at the oil fields, but caused no serious damage. While the attack was technically a failure, the psychological impact of Japan attacking our mainland was devastating. And Nishino got his revenge. So the next time your taking a leisurely stroll down Haskells Beach and you see this tired looking old clump of prickly pear cactus, take a longer look. It’s got a lot of stories to tell. Sources: Goleta Valley Historical Society, Wikimedia, Texas Energy Museum, Walker A. Tompkins and Justin Ruhge.